The smell of fall is in the air. Just this past weekend, I pulled out of fall candles. 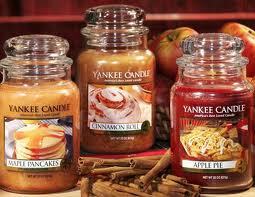 Yankee Candles are some of my FAVORITES, but I don't purchase them without a coupon. What's your FAVORITE Fall Scent? From Yankee Candle, mine is definitely Harvest.